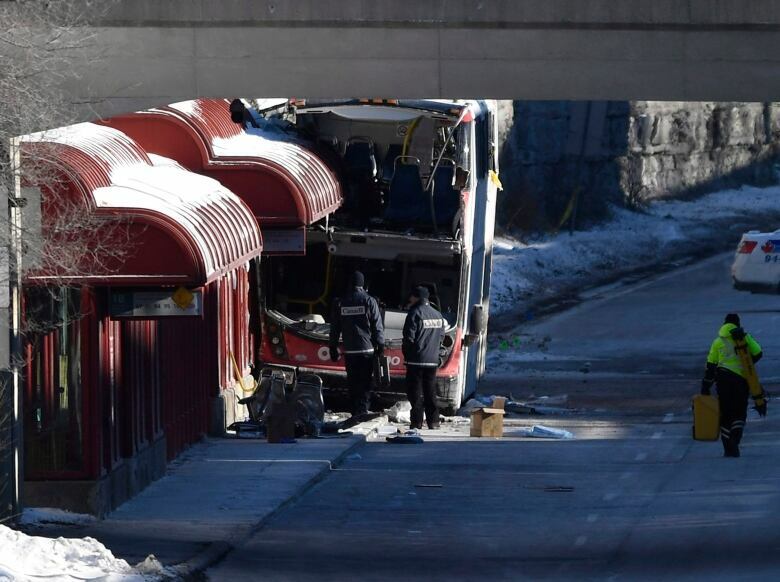 Ottawa police are preparing for a "long, detailed and complex"" investigation into how a double-decker bus slammed into a bus shelter late Friday afternoon — killing three people and injuring nearly two dozen more — but are offering no clear theories. 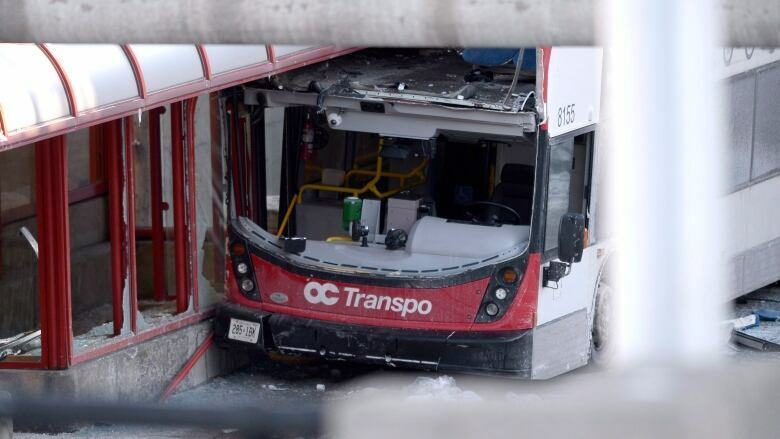 The city is still reeling after a westbound OC Transpo double-decker bus hit the Westboro station shelter just as afternoon rush hour was getting underway, in a scene that witnesses have described as "chaos." Sgt. Cameron Graham from the collision investigation unit, the team overseeing the investigation, told reporters on Saturday they're exploring a number of aspects, including "human factors," the vehicle itself and weather conditions. Graham said police will be flying drones today to take aerial shots and they hope to clear the scene, and the accompanying roadblocks, by the end of the day. The bus was towed away around 3:30 p.m. Shortly after 7 p.m., police said they had completed their documentation of the crash scene and that local roads — not counting the Transitway — had reopened. Officers believe the bus was at or near capacity, meaning about 90 people were on board, and they're hoping to interview everyone involved. The bus also records data that police will be reviewing, added Graham. The bus driver involved in the crash was taken in for questioning, but she was released later that night unconditionally pending further investigation. "It's important that the public does not read into the fact that she was arrested," said Police Chief Charles Bordeleau. "I'm not going into the details of why we arrested the driver but the fact remains that there was an arrest done." Bordeleau said while people might have a number of theories about what happened, it's important to go through this investigation "step by step." 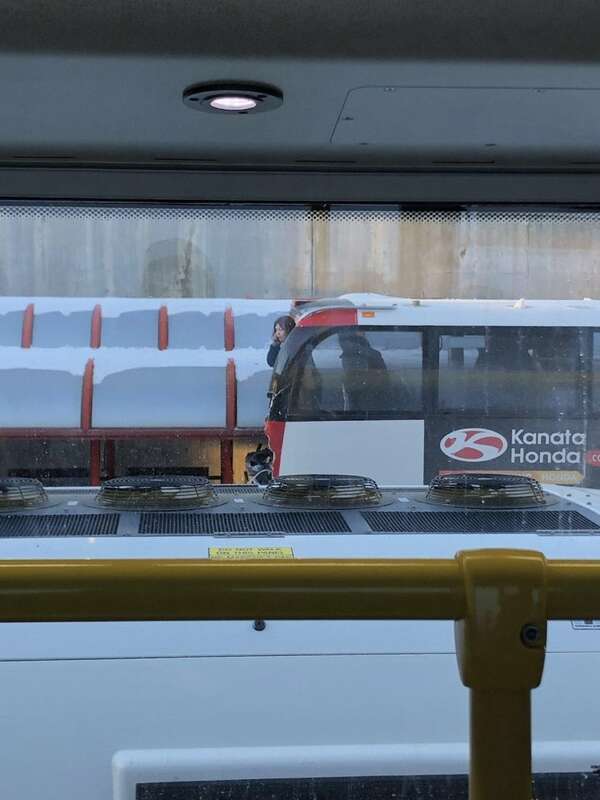 During a news conference Friday evening, Ottawa Mayor Jim Watson said two passengers and one person waiting on the platform died in the "horrific" crash, and 23 were injured. 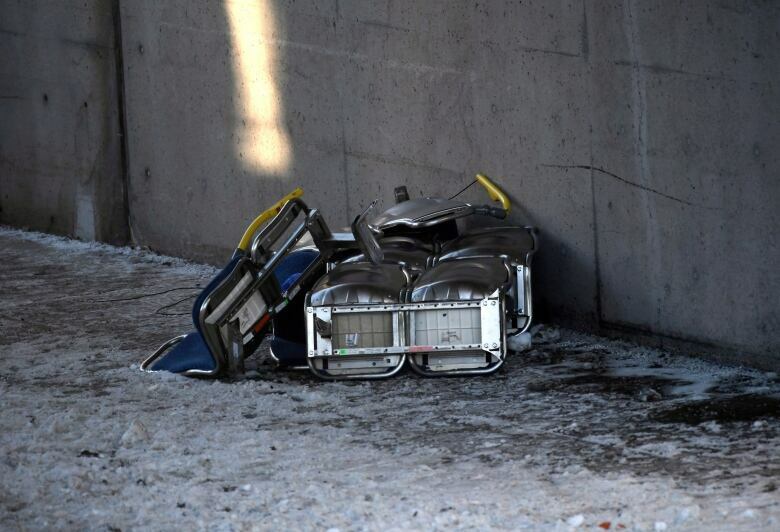 On Saturday Bordeleau clarified that they're still reviewing where the fatalities occurred. Ottawa police said investigators have identified all three victims and have contacted their families and loved ones. "That work continues this morning and no information on the identity of the three will be released at this time," according to a Saturday news release. As of 11 a.m. the Ottawa Hospital, speaking for the Civic and General campuses, said it has one patient in critical condition, six patients in serious condition, and four patients in stable condition, related to the collision. The Queensway Carleton Hospital said eight patients were admitted Friday night. Seven have since been discharged and one remains in serious but stable condition. There were no patients taken to the CHEO, a pediatric health and research centre in Ottawa, indicating there were likely no children among the injured. Due to the investigation, OC Transpo said its Saturday routes serving Westboro and Dominion stations are on detour between Lincoln Fields and Tunney's Pasture stations. Officials from Transport Canada and Ontario's Ministry of Transportation are also investigating. Bilal Gill was at the back of the Route 269 bus — which doesn't stop at the Westboro station in the afternoons and heads straight from Tunney's Pasture to Bayshore — when the collision occurred. "The bus started swerving, I guess it hit the curb or hit something. It started swerving, the driver couldn't get control back and it just hit the Westboro shelter," he said in an interview with CBC. "A lot of people started screaming, people at the front who got pinned under their seats." Witnesses said first responders had to break windows and use ladders to free passengers trapped on the upper deck of the bus. "There was definitely people pinned and there was a bit of blood on the floor," Gill said. "It was chaos at first." 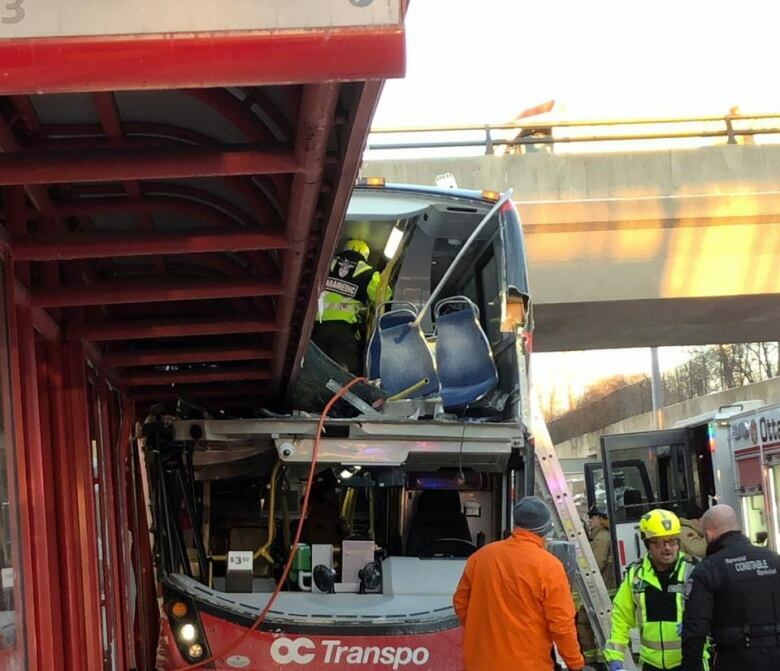 OC Transpo general manager John Manconi told reporters the bus could have been holding as many as 90 passengers and that the agency would be co-operating fully with the investigation. The family reunification centre at the Churchill Seniors Centre has since been closed, but people seeking information about family members involved in Friday's crash can call the Canadian Red Cross at 1-855-797-8875. Anyone who was involved in the Westboro incident and is looking to collect their belongings can call 613-236-1222 ext. 2481. "We are receiving many calls and we ask for your patience as we try and help you retrieve your belongings," police tweeted.